Today marks the kick-off of our annual Christmas Gift Guide Giveaway Bash! Every day this week we’ll be bringing you a list of top toys for different age and gender groups on your list. Make sure you enter the giveaways at the bottom. First up is our list for babies. Babies are a really fun group to shop for! They are always learning new things and it is so fun to watch them grow. 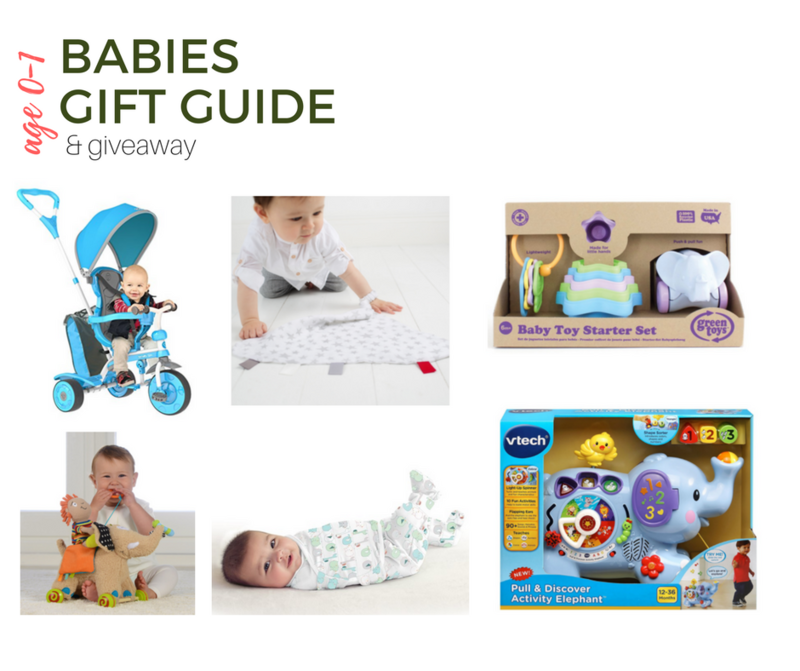 Here are my top gift ideas that will keep them entertained and help support their development. Also keep in mind that you can keep things low key for this age. The empty box will probably be their favorite toy so don’t go too crazy. 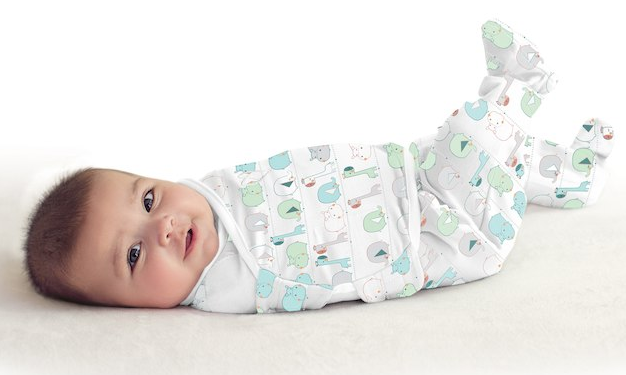 This is a great alternative to a traditional swaddle. Their arms are contained but they are able to kick their legs, so it allows for proper hip development while the swaddled arms will (hopefully) help them sleep! Designed for babies birth-3 months this is perfect for the smallest gift recipients. This is a similar idea to the Foostie but has a completely free leg design. This means those midnight diaper changes aren’t quite as big of an ordeal! This is also for babies ages birth-3 months. The perfect all-in-one gift! 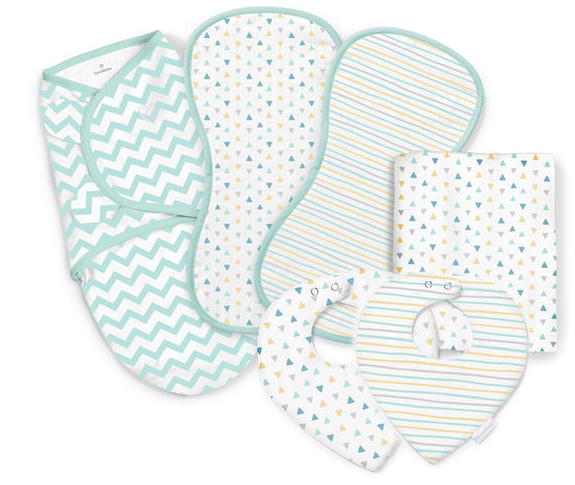 Get everything you need for newborn survival all in one little happy bundle. There are different gift set options for sleeping and bathing. These sets come in fun prints and are so soft. If you go on a walk at any given park or neighborhood you’ll most likely see a family using one of these because they are so great! 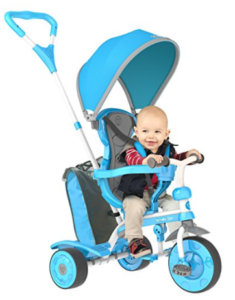 They convert so you’ll start off pushing your little one and then you can switch it into a trike. It even has a great canopy to keep the sun off your baby on your walks. 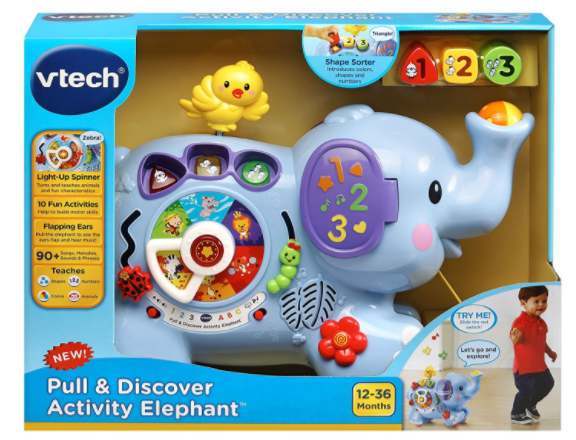 V-Tech toys are always educational and this little elephant is no exception. It is packed with fun play options. You can learn animal sounds, phrases, and music. They will also be able to match blocks and pull it along. The perfect lovey for kiddos for take on all their adventures. It has a loop that can be attached to baby’s arm or car seat so it won’t get lost. It is made from organic muslin and comes with sensory tags. Worried about the plastic your kiddo is putting in their mouth? Green Toys are a great option! 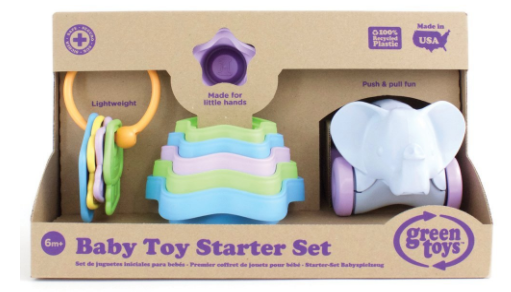 This set is non-toxic, with no BPA, Phthalates or PVC. It is even dishwasher safe which makes clean-up easy! This set includes keys, a stacker, and a pull along elephant. It is the perfect set to grow with your child throughout their first year and beyond. How cute is this little guy! This toy is great for new walkers to pull along but also has a rattle and teether for younger babies. The ears are made from a fun crinkle material for sensory play. The elephant has fun colors and is machine washable. This is perfect for ages 6 months and into their toddler years. They can play basketball, soccer, and bowling! The basketball goal is adjustable and this toy has over 75 phrases. It folds up for easy storage and includes all 3 balls needed. This is a great toy that will grow with your child. Take 2 legs off when they are little for side laying play. You can take all the legs off and put it on a mattress to encourage crawling. Then will then use it to learn to pull themselves up! This giveaway is sponsored by SwaddleMe, Y-Volution, V-Tech, Cheeky Chompers, Green Toys and Dolce, but all opinions are 100% my own.